Today I came inside from an early morning outing a total mess: dirt under my fingernails, dirt decorating my pants and smudged on assorted patches of skin where I had swatted at hungry mosquitoes. But there were also two tomato plants in the ground, a bit of weeding accomplished and one ecstatic dirty woman. That was my first “grubbing-in-the-dirt” session in months. I had let the combination of admittedly minor complaints keep me out of the garden and off my feet. I am a weenie when it comes to pain. Both Hubby and I wanted me healed up for travel planned for May. Home treatment has not worked. It hasn’t helped the skin issues that prohibit wearing the electrical stimulation device that helps me walk. Neither have at home efforts helped ingrown toenail recurrences. Some cutting by a dermatologist and both cutting and chemical treatment by a podiatrist have been more successful. I am getting back on track. The toe is healing. The skin has healed. And I am building up my wearing time with the estim. I’m walking out with more confidence and more balance, both physical and mental. Movement, garden, sunshine, gentle breeze, physicians, the patience of friends and family--blessings all. Younger son Jeremy emailed me the photo above today. It did some major tugging on my heartstrings. Nana (That’s a younger me.) and two of older son Walt’s little ones visit their newborn cousin Molly Kate. 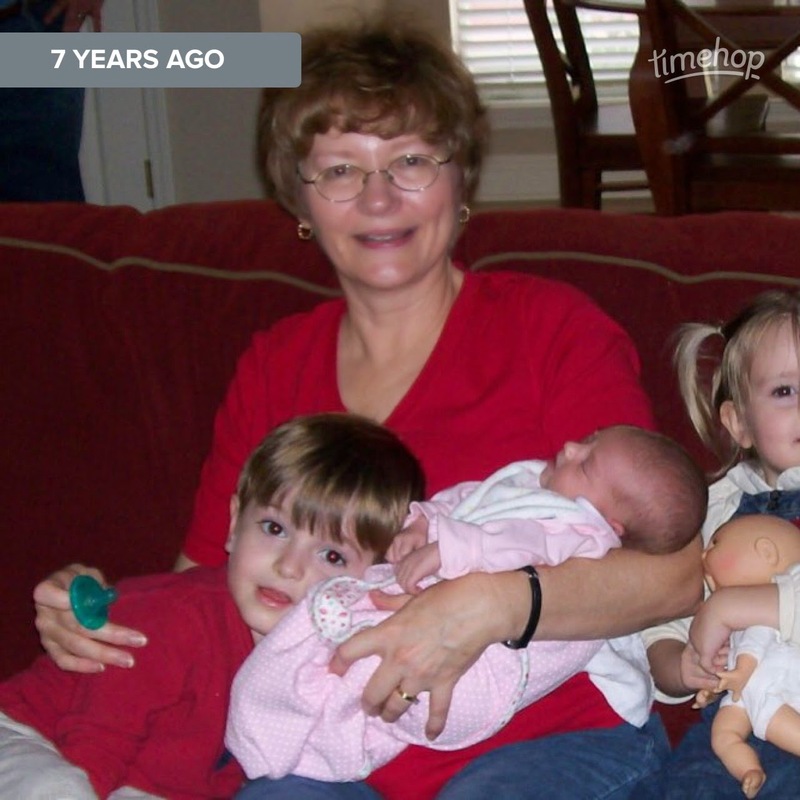 This photo was a ramble down memory lane with these little ones who, with our eldest grandson, filled my heart with joy back then. There are now six grands, ages 12, 10, 9, 7, 6 and 4. The joy continues to grow as they grow.